The µVision3 Logic Analyzer provides a graphical display for value changes of variables or VTREGs that you specify. 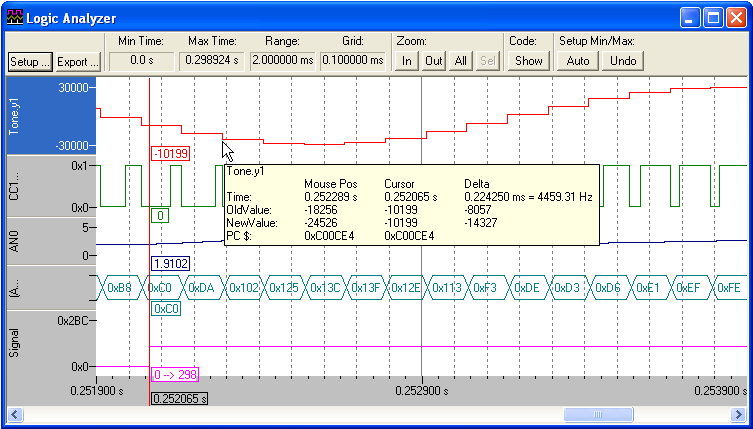 The Logic Analyzer window contains in the top border several buttons and display fields. The Setup... dialog defines variables for signal recording and configures the display output. Some configuration settings may be also changed from the context menu that opens with a right click on the signal name. Export... writes the current recorded signals to a tab-delimited file for analysis with external tools. Min Time: Start time of the signal recording buffer. Max Time: End time of the signal recording buffer content (typically identical with the current CPU time). Range: Time range of the current display. Grid: Time range of a grid line. The Zoom buttons define the time range of the display. Zoom All shows the complete content of the signal recording buffer. Zoom Sel changes the display to a selection that you have previously marked with a mouse drag while holding down the Shift key. Code Show opens the source or disassembly window at the code position that causes the signal transition. Setup Min/Max configures the display range of a signal. Auto configures the max. / min. values based based on the values from the current recording. Undo restores the previous settings before the Auto button was clicked. Set cursor line with a mouse click. The cursor line displays all variable values at the selected time stamp. Move cursor line to previous or next signal change with Left or Right cursor key. The signal is selected with a mouse click in the left border. Show detailed information by placing the mouse cursor near a signal change (the Logic Analyzer snaps to the closes signal change). The information box shows the signal delta values based on the current cursor line position.